In the largest grant distribution in CAF’s 25-year history, $4.3 million in sports related grants for adaptive equipment, coaching, mentoring and competition expenses was awarded to 2,806 individuals with physical challenges.Â That means, 2,806 individuals of all ages and levels put in the time and effort to apply for a new challenge, leaping out of their comfort zone and into an active and fulfilling lifestyle. With grants funded over 95 different sports and activities from basketball to CrossFit and rock climbing, itâ€™s clear that grantees at every level are eager to try something new and discover the unique activities that make them feel whole. 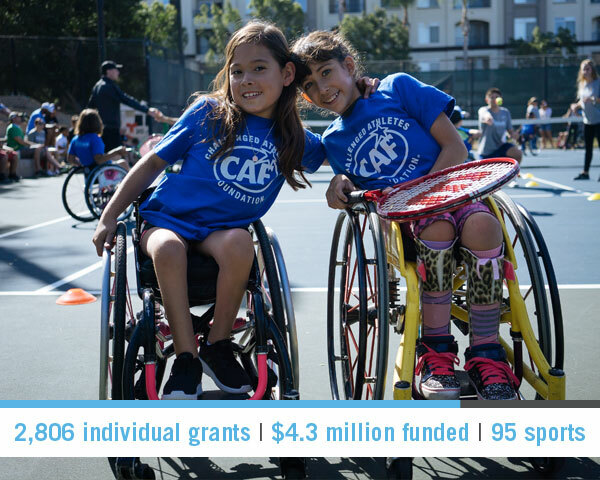 CAFâ€™s grant season is focused on getting more people active every year by developing the inner athlete of individuals at every level â€“ young enthusiasts, Paralympic hopefuls and weekend race warriors. With access to the necessary tools and opportunities, the question is no longer, “Why me?”, but, “Why not me?”.Â Feelings of hopelessness are replaced with fulfillment, confidence and independence leading to a well-rounded life in sports and beyond.